Blackpool’s first season has been characterised by attacking football as the Tangerines have found goals relatively easy to come by. However, it is their defence that regularly comes under scrutiny and more so since their run of five defeats after the Liverpool victory. This post will look at the Blackpool defence and explore as many facets of it as possible in order to establish what is behind Blackpool’s defence and where have things been going wrong? Blackpool have conceded 49 goals at an average of 1.96 per game. It has been well publicised that Blackpool tend to concede late in games and the following table breaks down the time periods in which Blackpool concede goals (up to and including the Everton game). Notice how Blackpool have conceded 14 goals in the final quarter of games. The reasons for late concessions can be speculated upon and none more so than in the recent post about the Everton game. In this game Holloway tried to shut down the defence and reverted to a five man defence which back fired mainly through a combination of positive attacking from Everton, but poor defensive organisation. A multitude of other reasons can be examined; however, this would involve a lot of conjecture about fitness levels, quality of the opposition, experience and the like. Blackpool play with a back four and it would be fair to say that (based on the most appearances) that Blackpool`s first choice back four, from left back to right back would be; Stephen Crainey, Ian Evatt, Craig Cathcart and Neil Eardley. Alex Baptiste covers at right and centre back and David Carney covers the left back spot. Dekel Keinan had been acting as back up for the centre back position before his recent move to Cardiff City. It is also important to understand that Holloway has used Matthew Phillips at right back at times this season, which underlines something about his defensive philosophy as Phillips is primarily a forward. 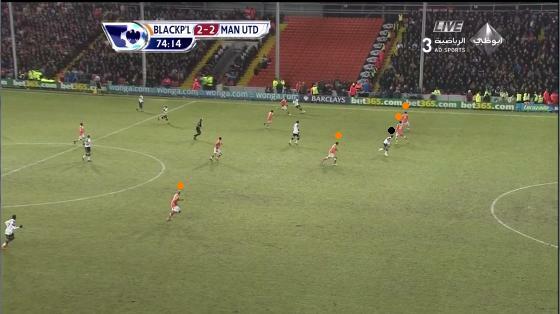 This was covered in December through an extensive focus on the Blackpool full backs. where it was established that Holloway uses his full backs to attack as the best form of defence and by pushing up his full backs he exerts great pressure on the opposition in their own half and the final third of the pitch. Blackpool haven’t been able to select a consistent defensive line up for many reasons, injuries being the key one. This instability in selection cannot help the overall performance especially from a unit that needs time to gel and build up communications. Ian Evatt joined Blackpool under Simon Grayson, a traditional ‘big’ English centre-back that wasn’t afraid to get stuck in. Since Holloway took over, Evatt has evolved and progressed in to a centre back that passes accurately, steps out of defence and where possible attempts to trigger attacks. He personifies so much about where Ian Holloway has brought Blackpool. Before his tenure, a ball running towards the touch line and out of play may well have been left to go out for a throw in. Now Evatt will control the ball, roll his foot over it, move with it and distribute it safely as Blackpool build their play with considered passing from the back line. Let’s take a look at Evatt’s statistics this season. He does his stuff he does! 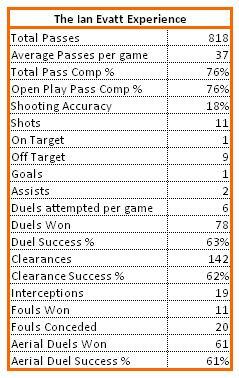 The stand out figures here are his pass completion of 76%, which is good for a centre back and forms a key part of the passing game that Holloway has brought to Blackpool. Other stand out stats to focus on are his tackle success of 63% and within that his aerial duels win percentage of 61%. What isn’t shown here is the volume of tackles that he has lost this season, in total he has lost 46 duels this season at a rate of 2 per match. Here lies the crux of any defenders work, it not always the tackles you win that help the team, but the consequences of what happens when you lose a duel? Does your opponent punish you or not? To sum up Ian Evatt’s development under Holloway, look not to the superb performances he has put in this season, but look to the goal he scored against Coventry at Bloomfield Road last season. Solid technique, breaking out from defence, good passing ability and the ability and awareness to curl a shot in to the goal. The media have criticised Blackpool’s defence at times this season and Ian Holloway stated that he wanted to attack and not defend in the Premier League. 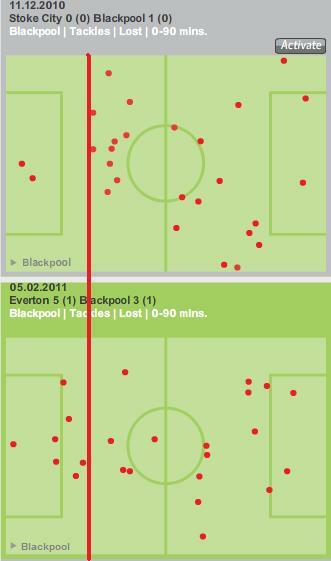 However, Blackpool can defend and the following sequence sheds some light on the way they organise their back line when coming under attack. Firstly, a sequence from the Liverpool game, showing attacks from the left, and right. Clearly when you freeze the action you can see that they set themselves very well and in these instances they fended off danger. 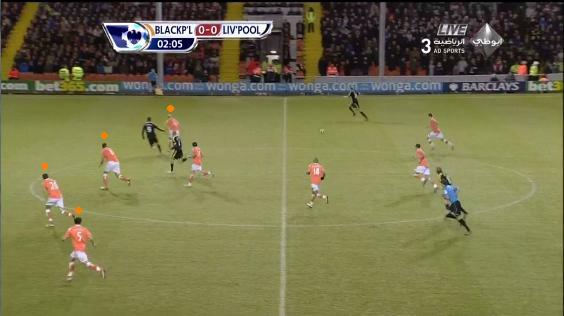 As Liverpool advance down their left, note how Blackpool's back line is spaced and cover in a line across the field of play. 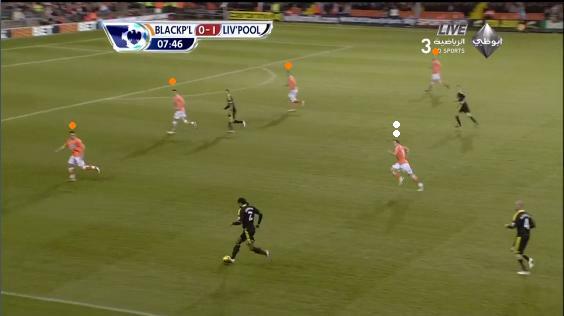 What is also key here and is a common when Blackpool is under attack is how David Vaughan (white dots) tracks back to support the right back. 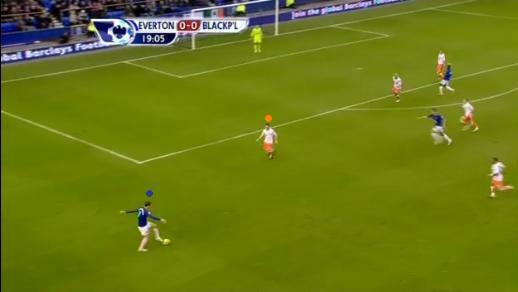 This also happened for Everton’s first goal in last weeks match. Likewise as you’ll see below, when the attack comes from the other side, Charlie Adam tracks back to support the left back. Here Stephen Crainey closes out the space out wide whilst Ian Evatt tracks his runner in to the corner area. 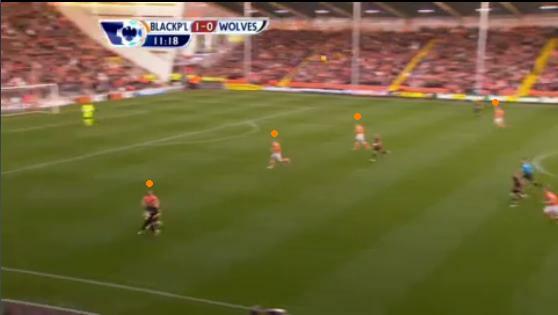 Pick any match and Blackpool’s defensive shape can be impressive, here’s another example to back this up from the Wolves game. As a long ball is hit from deep in the Wolves half, the defence coped perfectly well to see off the danger. Note that the four defenders are relatively evenly spread across the pitch. This time the attack comes aerially against Wolves in to the Blackpool right back area. Eardley get's positioned in order to make a challenge should be required to. An observation from a few games this season is that Neil Eardley stands off his man and gives him too much space as can be seen from the Everton game. However, given the examples above, it can’t be ascertained if this is the fault of one person given that above you can see that Ian Evatt covers one runner in behind whilst Adam and Vaughan work hard to track back. When Blackpool fail to defend, it is purely a case of failing to defend as a team or as we will see below, being punished by excellent opposition. When looking at Blackpool’s defensive shape, the biggest question hangs over their ability to cope with a side that is counter attacking them. In such transition phases sides either have a basic shape in place at all times to counter that or have plans for getting back in to shape; mainly requiring a lot of energy, pace and discipline in order to recover. However, quick counters and unexpected passes from deep can catch Blackpool out. Look at the following shots below from the Liverpool game. The back line is retreating, no offside trap can be sprung, they are responding to the fact the Torres has crept in behind Stephen Crainey and space has opened up on the left. 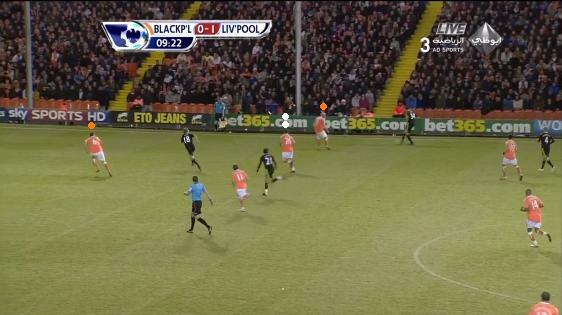 Liverpool break quickly and the intelligent movement of Torres is too much for Blackpool. Against Manchester United they were undone twice by balls from Paul Scholes played from deep. This caught them off guard, on one occasion playing a dangerous offside trap against Javier Hernandez who has excellent pace and movement to escape many top quality defences. Anticipation of the pass and covering the runner may have ensured a more composed response to what was an early warning of the Manchester United comeback. Realising that an unexpected ball in being played from deep, Blackpool try to play offside and the poor organisation causes a chance for Man Utd. Look how Craig Cathcart loses his spacing from his right back and the two defenders leave space for Man Utd to attack. Above you can see how the spacing in the defence has been lost as an early pass from deep has been lofted over the defence. Where Hernandez (black) is, is exactly where Cathcart needs to position himself instead of being dragged in to the right back area. It’s fair to say that in predictable situations Blackpool can and do defend well, the biggest problem they face is the unpredictable and in the Premier League there is so much more of that due to the quality of the opposition. Anticipation of danger goes up a level, reactions, pace of response; all of these become so much more important at this higher level. It may be no coincidence that the five clean sheets have come against three teams who had poor attacks on the day (Wigan, West Ham and Sunderland) and two teams who had one game plan based on direct approaches to target men (Newcastle and Stoke). Added to this is that unpredictable factor has been heightened by the fact that 4 goals have been conceded whilst the team had a player off for treatment. Defensive positions weren’t covered adequately, caused issues and goals were lost. It would be easy to try and show the duels that Blackpool make on a chalkboard, it will show duels being won all over the pitch in the main with many players contributing to that effort. However, a quick look at the chalkboards from the Stoke game (clean sheet) and the Everton game (five goals against) give a little illustration of where defence can go wrong. The chalkboard here is of the duels that Blackpool lost in both games. The key factor here is to note where they are lost. In the Stoke game, only two tackles were lost in the final third, against Everton that number rises to seven. 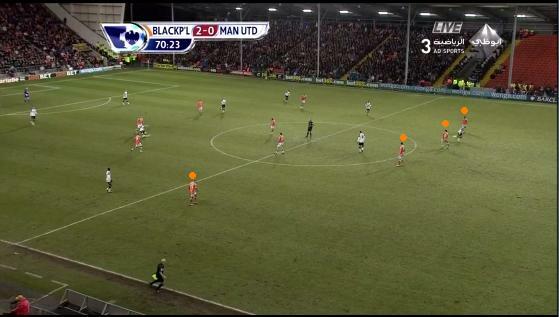 Note where the tackles are lost in the lower chalkboard as Blackpool's defence concede five goals. This factor of where you lose your tackles (not necessarily where you win them) can be crucial. Lose too many tackles too close to the goal and the attackers may have to do less in order to score. It also gives you less space and possibly time to recover. Fail in the tackle further from the goal and the danger is further away, simple. As mentioned in the post on Blackpool’s full backs and in other posts, Blackpool build their game on passing and Holloway sees that attacking teams as his best way of defending. As Blackpool have hit five defeats on the trot it is interesting to note that their pass count has dropped as well as completion rate. Quite simply they were keeping the ball better, for longer earlier in the season and now they are not. Teams appear to be working harder now to close down the space and specifically to stop the ‘keeper distributing from the back. In the games since the Liverpool match Blackpool’s average match pass count stands at 441 with a completion of 70%. Prior to that game it stood at 475 with a completion rate of 75%. One factor above centered on the selection of a consistent back line and this hasn’t been helped by injuries to all three goal keepers. Matthew Gilks started the season the first choice playing 12 games, conceding 23 and making 48 saves in the process. Since being injured at half time at West Ham Richard Kingson has come in playing 12, conceding 21 and making 61 saves. Both have performed well, but the latter, recently making mistakes leading to goals against West Brom and West Ham. Blackpool will concede more goals as this season progresses, but should Blackpool get back to winning ways, it may be due to improvement in ball retention. Defenders make mistakes, they all do, however, Blackpool will be hoping that they aren’t making them in the danger areas and if they do that they either recover from them or they aren’t punished. When the opposition is predictable Blackpool look assured; they’ll be looking to improve and find that assurance when unpredictability strikes.